Shoegaze is back, baby! Time to grow your hair so it hangs into your eyes, put on some baggy shirts, and sway to heavily distorted music while contemplating your shoelaces! 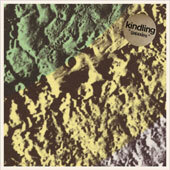 Kindling are a new shoegaze act. It looks like they have only been together for a few years, but this 4-piece from the middle of Massachusetts do a great job with the sound and the style. This is an EP of noisy, distorted fun. Guitars echo and pulse under the weight of layers of distortion pedals while the rhythm section thunks away and the vocals are a faint haze that surfaces from the guitar noise. It's a pretty straightforward and time-honored style, and any reader of this site will know that i really enjoy this kind of thing. It is a short EP, noisily sweet and to the point. Kindling give us 4 songs in about 15 minutes. The first is Blinding Wave, which starts with a flurry of trebly guitar. Gretchen Williams' voice is way back in the mix, under the grinding guitar haze. The song reminds me of early Lush, and that is a good thing. Stephen Pierce, the other guitarist/vocalist of the band, takes over on While Away, his voice again lost in the mix. I don’t know if it the male voice or something in the distortion, but there is a hint of MBV-ishness to the song. It's a great tune, really grinding. The next tune is called Painkiller and at five and a half minutes it is just about as long as the previous two tunes combined. Here, in this loner format, Kindling stretch out a little and explore a really lovely melody built up through waves of echo and distortion. Williams and Pierce harmonize nicely. I really like what they are doing here. And finally the EP ends with Coastal, a minute and a half of grinding guitars where the band channel Dinosaur Jr. just a little bit.